With his signature graphic style, embrace of figural distortion, and bold defiance of conventional norms of beauty, Egon Schiele was one of the leading figures of Austrian Expressionism. His portraits and self-portraits, searing explorations of their sitters' psyches and sexuality, are among the most remarkable of the 20th century. The artist, who was astoundingly prolific during his brief career, is famous not only for his psychologically and erotically charged works, but for his intriguing biography: his licentious lifestyle marked by scandal, notoriety, and a tragically early death of influenza at age twenty-eight, three days after the death of his pregnant wife, and at a time when he was on the verge of the commercial success that had eluded him for much of his career. Creating some three thousand drawings over the course of his brief career, Schiele was both an extraordinarily prolific and unparalleled draughtsman. He regarded drawing as his primary art form, appreciating it for its immediacy of expression, and produced some of the finest examples of drawing in the 20th century. Even his painterly oeuvre revealed a style that captured some of drawing's essential characteristics, with its emphasis on contour, graphic mark, and linearity. 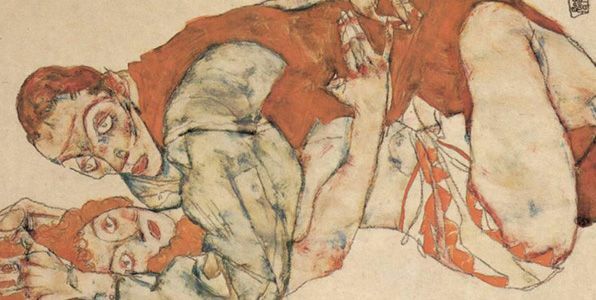 To counter what he called, “a mourning world,” Egon Schiele put his faith in art that “could only stem from intimacy,” as he uniquely combined torment and eroticism in his Expressionistic works. This is one of Schiele's many portraits of his younger sister, Gerti, the artist's favorite model during his early career and the member of his family with whom he was the closest. Painted when Gerti was a teenager, this early portrait demonstrates both the strong stylistic link between Schiele's work and that of Klimt, as well as the shift away from the style of his mentor. In her pose and adornment composed from a series of flat patches with gold and silver accents, Gerti's figure is reminiscent of Klimt's works such as Portrait of Adele Bloch-Bauer (1907). But unlike the Klimtian predecessor, the image is not so much decorative as static and soft, as if Schiele were casting his sitter in clay. In addition, Schiele replaced Klimt's richly shimmering, gold-dominated palette with more muted colors, creating an image that appears dried-out, suggestive of decay rather than growth. 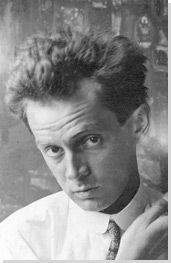 This is perhaps Schiele's most celebrated self-portrait, and certainly the most storied. In this work, painted during a time in which he was participating in numerous exhibitions, Schiele gazes directly at the viewer, his expression suggesting a confidence in his artistic gifts. Although Schiele deploys less distortion than in other self-portraits, the painting refuses to idealize its subject, featuring scars and other lines characteristic of the contoured manner of the artist's drawing style. This rare double portrait, among the most allegorical works in Schiele's oeuvre, shows Schiele and Klimt standing together, nearly as one. As close as the two men were, and for all their similarities, Schiele spent much of his career seeking to break free of Klimt's influence. In Hermits, both men wear their signature long black caftans, an item of clothing for which Klimt was known, and which Schiele appropriated for his own work, perhaps in tribute. Never one for modesty, Schiele positions Klimt in the background, blind and mostly hidden, as if being consumed by the younger artist. The resulting form evokes the image of a single dark figure, indicating the confident successor Schiele assuming the mantel of the old master. The hermit motif also evokes Schiele's existential conception of the artist as a figure existing at the margins of society. In this painting, one of Schiele's most complex and haunting works, the female figure, gaunt and tattered, clings to the male figure of death, while surrounded by an equally tattered, quasi-surreal landscape. As elsewhere in his work, in this composition Schiele combines the personal and the allegorical—in this case by turning to a theme deriving from the medieval concept of the Dance of Death that reached its height in 15th-century German art. Death and the Maiden was painted around the time Schiele separated from his longtime lover, Wally Neuzil, and several months before he married his new lover, Edith Harms. The painting memorializes the end of his affair with Neuzil, seemingly conveying this separation as the death of true love. Interestingly enough, the manner in which Schiele's figures are nearly consumed by their clothing and abstracted surroundings suggests the portraiture of Klimt, who likewise placed his subjects within indecipherable environments. Although his art centered on the human figure, Schiele—who had occasion to travel throughout Europe during his career—was also drawn to the land and cities. In fact, the artist's paintings of the countryside and his native Vienna comprise a significant portion of his work. This painting was inspired in part by his mother's hometown, Krumau, where he lived briefly in 1911. Schiele's landscapes—although often devoid of people—contain fascinating parallels with his figural work. His frequent use of a bird's-eye perspective in his landscapes calls to mind one of the most radical elements of his portraiture: his tendency to depict his sitters from above. This canvas contains other characteristic elements of Schiele's idiom as well, most notably, his use of boldly outlined and sharp contours. What causes this work to stand apart from his portrait work is the artist's use of and range of color, something for which Schiele was not known.